Clean conditions today. Nice Swell size and light offshore breezes makes for very clean surfing conditions at Bingin & Impossibles (and all other spots on the Bukit) Best conditions at Low tide today. The forecast for Bali Bukit for the next few days. Want to use photos from WaveHaven for your blog? 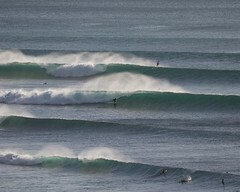 Need and incentive to visit Bali on your next surf holiday? Looking to learn to kitesurf in the Caribbean?